DRAMATICALLY LIGHTEN IN JUST ONE STEP. NO DRAMA! Is B4 right for me? Garnier Nutrisse Ultra Color B4, "Caramel Chocolate," is designed to lighten up to 3 levels without bleach. 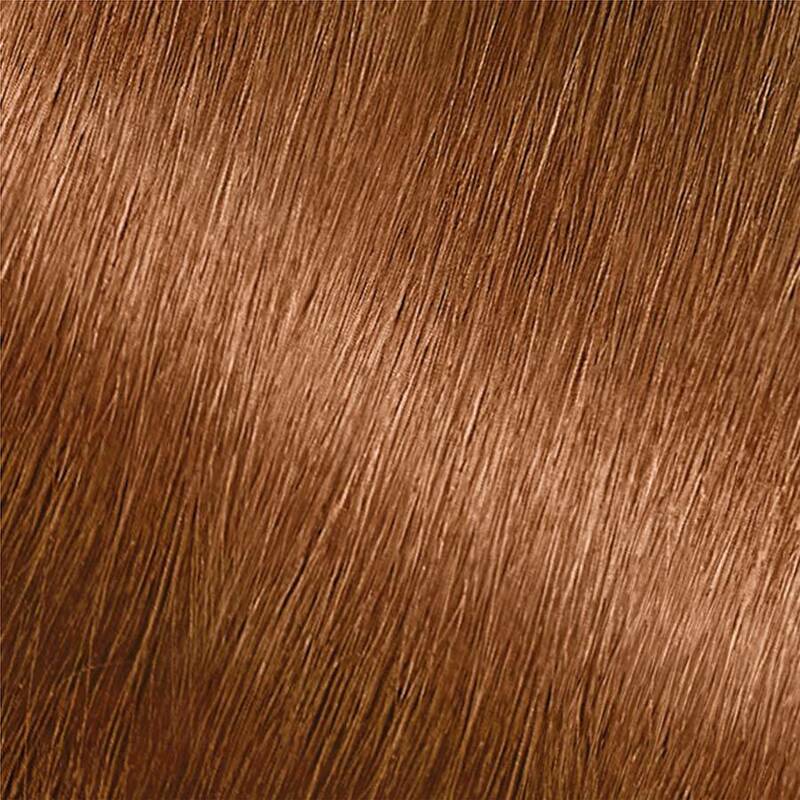 This shade is specially formulated to have hints of gold and mahogany tones for the most flattering reflect. It is best for anyone with natural hair between medium brown and black. It is also the signature shade of Nutrisse spokesmodel Blanca Soto, who is featured on the carton. For other Ultra Color Brown options, explore shades B1, B2 or B3. *For women with currently colored hair, there are special considerations for the color result you can achieve. Because of this, we do not recommend shade B4 for hair that has been previously bleached, highlighted, hair that is predominantly gray, or if you have previously colored your hair "Medium Brown" or darker. For more help, use our Shade Selector Tool to find the perfect shade for you! 5) Spread mixture on the hair length to the ends, avoiding the root area. Time for 10 minutes. 6) After 10 minutes, apply remaining mixture to root area—leave in for an additional 20 minutes (Total 30 minutes). 7) Massage hair with small amount of water before rinsing to optimize rinsing process. 8) Rinse hair thoroughly until water runs clear. 9) Apply Nourishing Conditioner (D) and leave on for two minutes, then rinse thoroughly. If you only a need root touch-up, please follow insert Touch-Up Application instructions. Nutrisse Developer: Aqua/Water, Hydrogen Peroxide, Cetearyl Alcohol, Trideceth-2 Carboxamide Mea, Ceteareth-25, Glycerin, Pentasodium Pentetate, Sodium Stannate, Tetrasodium Pyrophosphate, Phosphoric Acid. F.I.L. D12850/19. Rated 5 out of 5 by Melsbells from Gorgeous shade! I only use Garnier color and love to play—this is the second time I used this shade, took my dark brow hair to a beautiful russet brown, love! Rated 3 out of 5 by AnimeMomLeika from First time user I bought this on Tuesday, March 13. I have hennaed my hair 20+ years ago. First time using permanent color. Wanted to cover greys, mainly in bangs, add a tint of color. Wednesday I had my hair cut and did not wash it, they used just water to cut. Went home after hair was dry, I dyed my hair. Results are okay in color, didn't want people to go, hey you dyed your hair. It felt really good in my hair when I rinsed it out, and a lot of oils. But I have to say, I removed my gloves when rinsing hair with water before conditioning, as the gloves were cumbersome. But it is okay no hair dye on hands. My sister uses only this company for her hair color needs, dyes it every 4 months, loves the product, that is why I went with Garnier. Definitely do this again, maybe a shade lighter. Rated 5 out of 5 by MELHOU from CARAMELCHOCOLATE BEST HAIR COLOR EVER!! BEEN USING THIS SHADE FOR A FEW MONTHS NOW! COMES OUT BEAUTIFUL ON MY NATURAL DARK HAIR. LIGHTENS AS IF I JUST WALKED OUT OF A SALON!! WHEN IT'S TIME TO TOUCH UP I USUALLY STOCK UP WITH AN EXTRA BOX!! Rated 1 out of 5 by Willwrk4vodka from No change I have virgin dark brown hair. No hair dye in it at all. I did a strip test of a huge chunk of hair and followed the instructions. Literally no change in color at all. Returning the second box I bought.